East Asia: The U. S. had occupational troops in the Philippines (1900 -40) and Canton, China (1900 – 1930). The surrounding societies had large numbers of recreational opium users. Although I know of no reports of opium use by American troops in these zones, the parallels to Viet Nam and Afghanistan suggest such use was likely. Panama Canal Zone: The Canal Zone was an American Territory from 1904 until 1999, and especially after the canal opened in 1914, large numbers of troops were stationed there. Early on, the troops used large amounts of marijuana, common in Panama. The use was high enough that the Army Surgeon-General conducted a study, including experiments giving marijuana to soldiers in controlled surroundings. His report, published in 1931 (and therefore available to Congress when they passed the Marihuana Tax Act in 1937), concluded that marijuana was less harmful than cigarettes (as ironic as that sounds today) and had no negative effects on discipline or performance. The S-G’s conclusion was that no regulation of marijuana was needed and that none should be instituted. World War II: The armies of the world discovered amphetamines just as World War II was beginning (amphetamine in American forces and methamphetamine in those of the British Empire, Germany, and Japan). Nickolas Rasmussen, in On Speed, gives an excellent overview of this use, not only in WWII, but in conflicts since then, but he does not delve into details. Use was widespread among combat troops, up to the three- and four-star command level, and leaked back to the support and replacement troops. Rick Atkinson, in The Guns at Last Light, says that in August, 1944, Allied authorities in Paris were kept busy with wide-spread marijuana sales to GIs. This was the first assertion of marijuana use by American troops in that war, but it reminded me that large numbers of troops were stationed in North Africa, where its use was endemic for over a thousand years, and fought beside French Colonial troops, many from parts of Africa where marijuana was common. A significant number of WW II veterans are still alive, as are greater numbers who served in the military since then. Oral histories could be a powerful tool to find out about day-to-day drug use by these soldiers. Korean Conflict: None of the popular histories of the Korean War suggest any drug use by troops. However, one friend of mine, a veteran of Korea, said that the Mexican-American troops he saw there always found some way to get their mota (marijuana). He also claimed to be unaware of any use of amphetamines. Viet Nam: The Vietnamese War was the first time that drug use by American troops came to the public attention. This use included marijuana, amphetamines, and heroin. Television news footage included scenes of soldiers “shotgunning” marijuana. Marijuana shipped or carried home by troops popularized “Thai stick” and “Maui Wowie” as common names for the weed. Heroin was the major dug story coming out of Viet Nam. Southeast Asia was at that time the world’s primary heroin supplier, and a surprising number of military personnel were returning from there with heroin habits. The army instituted drug testing for all military returning from there to the U. S., and some units were found to have at least twenty-five per cent of their members who had used heroin (no numbers were given to distinguish habitual from occasional use). Persian Gulf War: The brief engagement in Kuwait lasted only a few months. A later report from the Air Force Surgeon-General revealed that over sixty per cent of air combat missions were flown by air crews using stimulants (known as “go fast pills” by those using them). 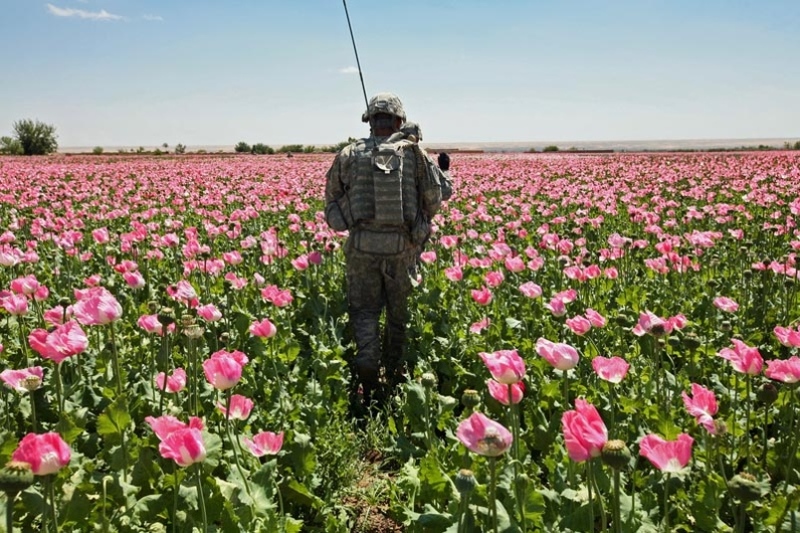 Afghanistan: The current war, the nation’s longest lasting, is in Afghanistan, the world’s leading producer of heroin and neighbor to Iran which has the highest proportion of heroin addicts in the world. Afghanistan is also a major marijuana producer. Although the military has tightly controlled news reporting since the Gulf War, a few stories have leaked out. One report claimed that Afghani hashish was being sold to American soldiers for $1.75 an ounce. This year a story reported that an Air Force flight crew was involved in a fatal car crash in Southern California. They were reported to have made a non-stop flight of over twenty hours from Afghanistan to California using stimulants to stay awake, then after landing and without rest or sleep, left the airbase, had a few drinks, and crashed their car. Do these little hints add up to a major narrative? I don’t know. But if I were a paleontologist and saw this number of bone fragments strewn across the landscape, I would start digging, confident that a dinosaur’s bones were below that surface. How can you help? If you know a history professor, show her this essay. If you were in the military, tell us what you did and what you saw. Ask your grandfather and uncles to tell their stories (grandmothers and aunts as well). Be sure to record what you get. And until some competent scholar gets involved, you can post your stories as comments to this piece or e-mail them to me. I’ll serve as a repository until a real historian gets involved. Afghanistan, 2009 (Drew Brown/Stars & Stripes). I was in the Air Force from 1969 to 1972 and drug use was everywhere, station in Japan we received drugs from Vietnam and the States. Got to Korea in 1964, well after the end of day-to-day fighting. Drugs were not an issue in Korea although they were becoming a concern to the military further south in Viet Nam, Cambodia, Thailand, Laos and even the PI. Alcohol was abused and the abuse was even encouraged – ten cent martinis and so forth. I was, among other things, a liaison officer from the 8th US Army Command to the ROK CIA, ROK Police agencies, and ROK Naval Intelligence. I worked directly with ROK Army Intelligence. Was quite involved actually with black markets but trafficking was in stuff like stolen US goods/equipment, illegal money transfers, arms, and non-drug smuggling. Lots of action there but no body was dealing drugs. I did run pirates/smugglers out in the Yellow Sea and some of those guys ranged down into the South China Sea and the East China Sea….trade in drugs picked up from the East China Sea south. Frankly, I cannot even remember hearing of anyone who used drugs in Korea. There must have been folks who did but certainly not many…obviously drug use was of interest to what we did as had there been much of it we could have used it to motivate/blackmail sources/agents….just completely unaware of drug use or abuse in ROK during the year or so I was there. That said, I suspect that even two years later the interest in drugs within the ROK with respect to US personnel would have started to spike. My guess = there was little to no drug abuse during the Korean War ….too soon after WWII and Japanese occupation of Korea, isolation of Korea from suppliers, dynamic flow of the war itself, etc. would have simply not provided a viable marketplace. The static nature of US garrisons following the end of active conflict would have helped establish a venue conducive to drug markets….just too many other things working against until wealth creation generally took off in Korea along with Korean integration with outside markets. Frankly, until after 1945 there just was not much interaction between Koreans and others. There was simply no developed transport, infrastructure, awareness….to make drugs work. Again – booze was the unrivaled handmaiden of boredom. I have been in the Army 24 years. I am currently writing an article on the development of the Army Alcohol and Drug Abuse Prevention and Control Program (ADAPCP). I have interviewed several key figures from that era, including two that testified in 1970 at senate sub-committee led by Sen Hughes. I am very interested in this work and its development. I consider myself a history student, specifically of substance abuse treatment in the military. My academic and professional background is HR, but I am a history lover with a growing interest in this avocation.